We’re receiving reports this morning that Pentagon City Metro is closed due to a suspicious package (is that you, Tiger Woods?) and that havoc is being wrought by a yellow line split in twain, and a blue line stopped near one of its choke points. Details are still forthcoming. Update, 10:50a: Metro has also closed Crystal City as part of the investigation and has started shuttle service from Braddock Road to Pentagon. Full initial release after the break. Update, 11:32a: Crystal City and Pentagon City have reopened. Two Metrorail stations on the Blue and Yellow lines are temporarily closed while Metro Transit Police investigate a suspicious package reported on the tracks at the Pentagon City Metrorail station around 9:50 a.m. today (Friday, Dec. 11). 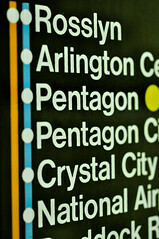 The Pentagon City and Crystal City Metrorail stations as the police investigate. Free Metrobus shuttles are running between the Braddock Road and Ronald Reagan Washington National Airport Metrorail stations to help riders travel around the incident. Please note that this is the verbatim release from Metro and has a few errors in it.